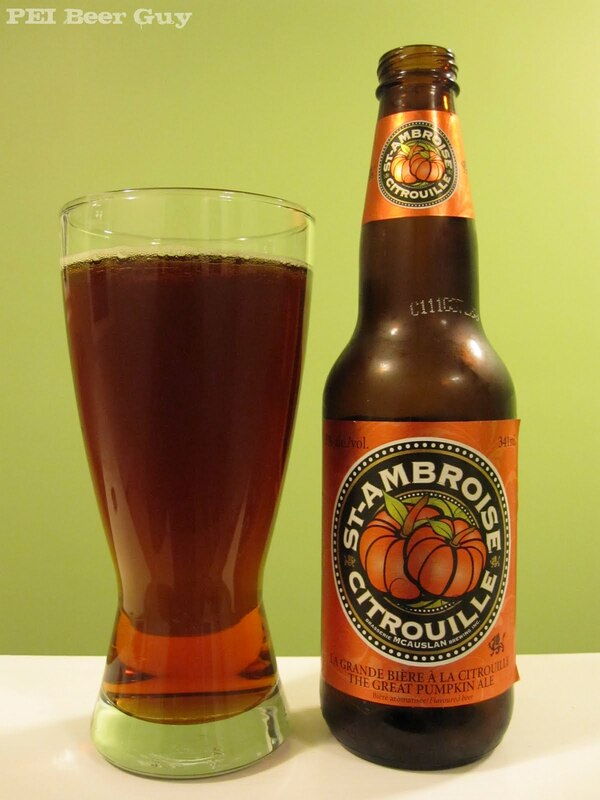 For a few years now, since I knew it existed, I have been wanting to try this pumpkin ale. 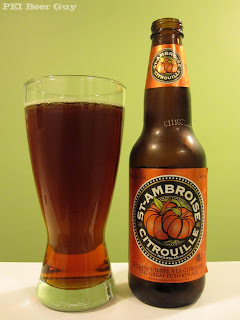 I figured it would be a pretty interesting beer, since, at that time, I had never had a pumpkin beer, and the other St. Ambroise / McAulsan brews I had quaffed were pretty darn tasty. So... this one had a lot to live up to. Even though it wasn't as fresh as it may have been, I was awfully glad to find it in March at Harvest Wines and Spirits in Bedford. The beer has a deep tint to it, giving a reddish-orange hue. A little bit of head in the pour is gone to basically nothing in a very short amount of time. You can see some bubbles in the clear ale, though. The smell is really familiar but hard to fully peg - I think it's mainly ginger with a bit of clove, and some really light cinnamon in the background - like cinnamon sugar. It almost has a brown sugar / maple quality to it. I think it's the brown/maple with the ginger combining as the dominant smell that made it hard for me to peg at first. There is definitely some pumpkin in the flavour, but I find the flavour to be more dominated by a subtle blend of the spices that accompany it. The mouthfeel is OK (maybe a little flat), and the body is on the heavy side of light. The finish is fairly clean - not too dry and not really wet or slick either. Overall, even after all the waiting, I'm still pretty pleased with this beer. It still seemed plenty fresh, even a month or so before its best before date. I can see how it would be even better in the fall / with a Thanksgiving-type meal.